From cookies and chocolate cake to hearty and satisfying soups and pasta dishes, a brand-new vegan cookbook is changing the game with a collection of 100 mouthwatering recipes. The Vegan 8: 100 Simple, Delicious Recipes Made with 8 Ingredients or Less is the debut cookbook of beloved vegan food blogger Brandi Doming, and recipes are not only plant-based; they are free from oil and gluten. Delicious vegan recipes that take only eight ingredients? Yes, it’s possible. Dinner doesn’t have to take forever. This recipe comes together fast, thanks to red lentils and easy ingredients. The Hungarian paprika, dry mustard, and tomato paste give this simple dish a wonderful depth of flavor. This soup goes great with some fresh crusty bread! 1. Add the onion, carrots, garlic, and 1 cup (240g) water to a medium pot over medium heat. Bring to a simmer, and cook for 8 minutes, stirring a couple of times during, or until the veggies are tender but not overly so. Remove the pan from the heat, and add the lentils, 2 1⁄2 cups (600g) water, tomato paste, paprika, dry mustard, salt, and pepper. Stir well, and bring to a boil over high heat. Cover, reduce the heat to low, and simmer for 10 minutes. 2. Add the milk, and increase the heat to medium-low; cook 5 to 10 minutes or until the lentils are tender yet still firm, and the soup thickens some. Stir often, and do not overcook, as you don’t want the lentils to become mushy. Taste and add more salt, if desired. Serve immediately. Note: Make sure the paprika you are using is not hot paprika. For the milk, it is important to use a creamy milk like cashew or “lite” coconut milk here for best results. The “lite” coconut milk is very creamy but yields no coconut taste. Almond and rice milks don’t do well, and definitely don’t use full-fat coconut, as it is too rich and thick and will ruin the flavor. Big thanks to Brandi Doming, the brains behind The Vegan 8 for being kind enough to share this amazing recipe. The cookbook officially goes on sale October 16, but you can preorder your copy today! Want more? 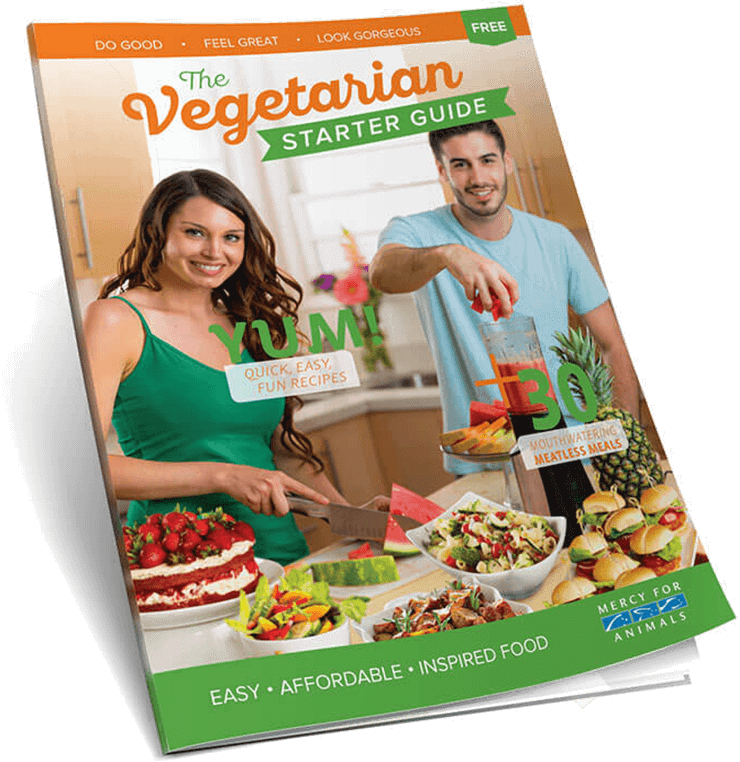 You can get yummy vegan recipes, easy meal ideas, and tips on changing your diet by ordering our FREE Vegetarian Starter Guide today.